Dual stage mechanism ensures constant output pressure throughout cylinder lifespan. Adjustable output pressure 0-8 bar to meet the needs of any aquarium (20L - 3000L). High performance integrated 12v DC solenoid - safe, low power consumption, cool temperature and guaranteed no noise. High precision Pisco valve for ultimate dosing control. Dual pressure gauges display input pressure and output working pressure. 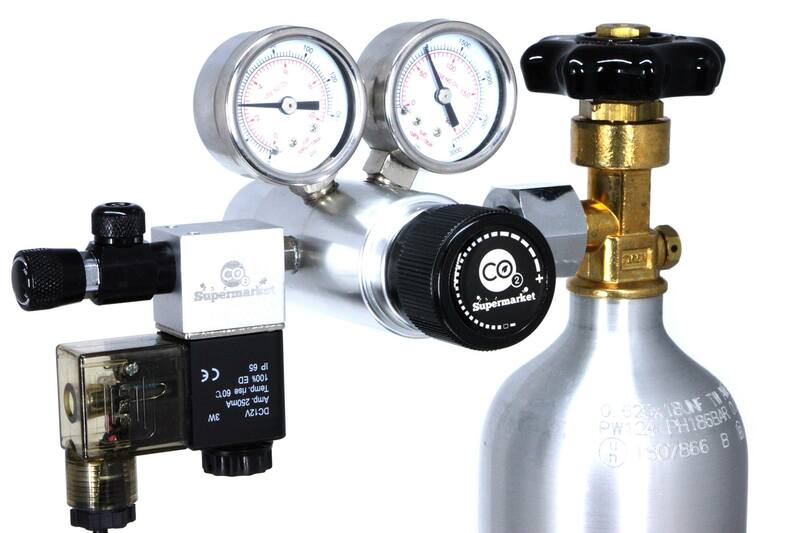 Incredible function, design and manufacture - the Ultimate Dual Stage CO2 Regulator with 12v DC solenoid and Pisco valve gives the highest performance possible. The dual stage mechanism ensures the output pressure does not increase, even if input pressure increases or decreases, as can happen during the lifespan of the CO2 cylinder. This gives you peace of mind that the pressure and flow will always remain at the level you have set it to. The adjustable output pressure ensures the regulator can meet the needs of any aquarium, whether it's a small nano aquarium of just 20L or an aquarium of 3000L that requires multiple diffusers, this regulator can deliver the pressure that's needed. The regulator comes with a high performance advanced 12v DC solenoid valve fitted as standard. It guarantees safe operation, low power consumption, cool operating temperature and eliminates the possibility of any buzzing sound. The addition of the solenoid enables the regulator to be connected to a timer plug or pH controller so that the dosing of CO2 can be controlled. This enables the flow of CO2 to be shut off when the aquarium lights are not on and the plants aren't photosynthesising and do not benefit from the addition of CO2. A high precision Pisco valve is fitted as standard, which provides a very high level of accuracy of CO2 dosing. Dosing can be achieved as low as 1 bubble / 10 seconds, to a constant flow of CO2, enabling it to function for small nano aquariums of 20L to large aquariums of several thousand litres. Plug the solenoid into a mains socket and switch on. The cylinder presure gauge will now indicate the pressure of the cylinder. Turn the pressure adjuster clockwise until it reads 40PSI, which is a good starting point for a single diffuser installation. With the bubble counter attached, turn the needle valve anticlockwise to achieve the bubble rate desired. 1 bubble / second is suitable for a 150L aquarium - adjust your dosing in accordance to this, i.e. 2 bubble / second for 300L aquarium. Fantastic regulator, very accurate and easy to use. Fantastic regulator, very accurate and easy to use. This is my second regulator the 1st time I got a really cheap import and used soooo Much co2! A friend said co2 supermarket supplied good quality equipment and they wasn't wrong. This regulator is sturdy the valve on the front helps to make sure there are no leaks! The pisco valve is amazing. There is a tiny control so you can make sure that you have the correct amount of co2 going into your tank. read more... This is my second regulator the 1st time I got a really cheap import and used soooo Much co2! A friend said co2 supermarket supplied good quality equipment and they wasn't wrong. This regulator is sturdy the valve on the front helps to make sure there are no leaks! The pisco valve is amazing. There is a tiny control so you can make sure that you have the correct amount of co2 going into your tank. The solenoid works a dream and with a timer I don't have to worry about it at all! Co2 supermarket answer my questions in no time at all and the parcel arrived really fast! Bought as a complete kit. Easy to setup and faultless operation for the past two years. Needle valve is easy to regulate CO2 supply. Bought as a complete kit. Easy to setup and faultless operation for the past two years. Needle valve is easy to regulate CO2 supply. I bought on recommendation from a friend who recently bought this same regulator and I've been equally impressed as he was. Excellent build-quality, great features with dual stage function, adjustable pressure, precision valve and 12v solenoid, and for a very reasonable price. I bought on recommendation from a friend who recently bought this same regulator and I've been equally impressed as he was. Excellent build-quality, great features with dual stage function, adjustable pressure, precision valve and 12v solenoid, and for a very reasonable price. I've had it working for just over a week and I can't fault it. Great quality and functionality at a very reasonable price. I've had it working for just over a week and I can't fault it. Great quality and functionality at a very reasonable price. I waited a long time for this to be released, and true to CO2 Supermarket's word, it was worth the wait. Incredibly high quality and function. I took it into work (I work in the oil and gas sector) and tested on one of the rigs there and confirm the dual stage system works flawlessly with no change in output pressure despite input pressure increasing or decreasing. The engineer said a dual stage regulator read more... I waited a long time for this to be released, and true to CO2 Supermarket's word, it was worth the wait. Incredibly high quality and function. I took it into work (I work in the oil and gas sector) and tested on one of the rigs there and confirm the dual stage system works flawlessly with no change in output pressure despite input pressure increasing or decreasing. The engineer said a dual stage regulator like this could easily cost nearly twice as much. Very pleased, and 100% grade from me.